Some clouds. Low 54F. Winds light and variable. 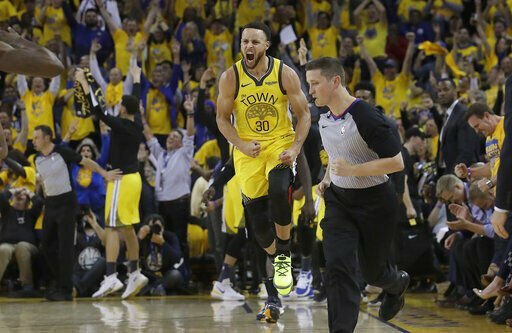 Golden State Warriors guard Stephen Curry (30) celebrates after scoring against the Los Angeles Clippers during the first half of Game 2 of a first-round NBA basketball playoff series in Oakland, Calif., Monday. Editor's note: These predictions were submitted Sunday night, before Game 2 of the Warriors/Clippers series. Here are my predictions for the first round of the NBA Playoffs. After the final days of the NBA season, the Los Angeles Clippers locked up the no. 8 seed and will, unfortunately, face the reigning champs. The Clippers are a very different team compared to the other playoff teams. They have little to no star power, yet they thrive off of scrappy play and extra effort. For the Clippers, this really is a team effort. Players like Danilo Gallinari, Montrezl Harrell, Landry Shamet and many more of their players have stepped up in a big way. I’ve been a huge fan of this team and their style, but ultimately, I don’t see them having a chance against the Warriors. In one of the most intriguing matchups of the first round, I expect this series to go to seven games. The Jazz showed how lethal they can be in last years’ playoffs when they beat the Thunder, while the Rockets have somewhat fallen off since last year. Don’t get me wrong, the Rockets are a serious threat to the Warriors in the West this season, but the Rockets simply just aren’t as good this year as they were last year. I expect this to be a long battle between the young stud Donovan Mitchell and the likely MVP James Harden, but I believe Chris Paul and the Rockets will pull it off in the end. The Blazers haven't won a playoff game since 2016, yet they've been in it every year since then. Defenses seem to figure Damian Lillard out come playoff time. Clearly, the Blazers don’t have the best luck in the playoffs Regardless, I think Billy Donovan is one of the most overrated coaches in the NBA, and won’t be able to draw up the right defensive scheme to stop the Blazers. The only way I see the Thunder taking the series is if Paul George can heat up quickly and lead the offense. If his shoulder injury is worse than we thought and he struggles, I don’t see how the Thunder could pull it off. This is another interesting series since while Denver is a two seed, its best player is Nikola Jokic. Jokic has been amazing this season, but he is no superstar. Star power becomes crucial down the stretch in the playoffs. Greg Popovich, the Spurs head coach, is likely the best coach in the NBA. Every year it seems, the Spurs are the underdog but they always put up a strong fight. Overall, Denver might struggle as they face the pressure of playing a Greg Popovich led Spurs team, but I don’t see a way that the Nuggets fail to beat the Spurs. The Milwaukee Bucks absolutely dominated the league this season, reaching the 60-win mark with the help of Giannis Antetokounmpo, my pick for MVP. To keep it short, the Pistons have no chance of defending the Bucks five-out system. Giannis might average 30 points a game during this series if things go how I expect. This should be a rather quick series. With Pacers’ star Victor Oladipo getting injured in January, the Pacers weren’t expected to be even a decent team. Instead, they maintained their high level of play to land the fifth seed in the East. The Celtics, however, have had an up-and-down season. One week, they are lighting it up. The next, they have problems in the locker room. Without Oladipo, the Pacers don’t have a go-to scorer to get a bucket whenever he wants. This will be an extremely obvious problem against the Celtics, who were playing very well in the final games of the regular season. This 76ers have a real chance at being upset by the Nets, as last season they wildly underperformed, losing in the second round in five games to the Celtics. The 76ers have all the pressure, and the Nets will play loosely as they always do. Ben Simmons has proven to be a liability in the playoffs. With his inability to shoot, defenses can sag off him and double team more often. However, with possibly the best starting five in the east, the 76ers should outplay the Nets, as Brooklyn won’t have an answer for star big man Joel Embiid. I thought this would be an easy sweep for the Raptors. Perhaps I just ignored the Toronto playoff curse or maybe I was just underrating the Magic. But after watching the Magic beat Toronto in Game 1, it seems Orlando actually poses a threat to the Raptors. Kyle Lowry scored 0 points on 0-7 shooting. I don’t expect the Raptors to perform this badly again, but maybe the Magic can challenge the Raptors a bit more than we all thought. Expect Kawhi Leonard to take over after a disappointing Game 1.